U.S. Federal authorities have seized the domain names of 150 websites on suspicion of peddling counterfeit and copyright goods. Feds have shutdown 150 websites in its biggest ‘Cyber Monday’ crackdown against counterfeiting and piracy. U.S Immigration and Customs Enforcement (ICE) and the Federal Bureau of Investigation (FBI) announced the results of a three-month investigation on Cyber Monday, one of the biggest and busiest online shopping days of the year. ICE Director John Morton and Assistant Attorney General Lanny A. Breuer announced the latest development in a crackdown that started a year ago and have already taken down 350 domain names since June 2010. These domain names were taken down on the suspicion of selling and distributing counterfeit and copyrighted items as part of their operation that targets websites that attempt to deceive consumers into buying fake goods and protect businesses against intellectual property crimes that threatens economic opportunities and financial stability. “This is straight crime, this is people being duped into buying a counterfeit.” the officials said, they also stated that most of these domain names were registered in the United States but run abroad, and are linked to selling everything from fake sporting goods, knock-off designer handbags, DVDs to imitation shoes. 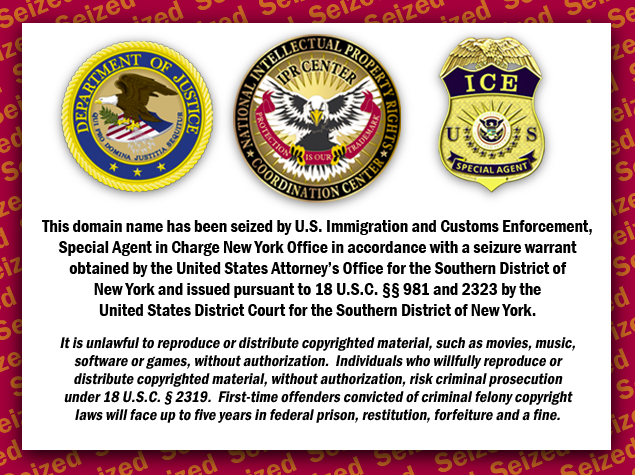 The seized domains are now in the custody of the federal government with their visitors left with a “seizure banner” explaining why the said websites were taken down and include a warning on copyright infringement. The New iPad is Finally Here!